When asked what their favorite restaurant is a lot of people will answer “L’Albatros.” This Zach Bruell restaurant features fine French dining in the University Circle area. Be warned that you will most likely have to pay for parking in the lot, because street parking is almost non-existent on the CWRU college campus. It is a popular choice before a Cleveland Orchestra concert. L’Albatros offers cozy indoor seating (including by a fireplace or tucked in alcoves) as well as an inviting patio in the warmer months. You can also choose to sit at their bar and enjoy some hand-crafted cocktails if that is what you prefer. The cocktails are delicious. Try the signature L’Albatros, featuring absinthe, pineapple juice, fresh lime and mint or order a special cocktail featuring lavender or any number of delicious ingredients. 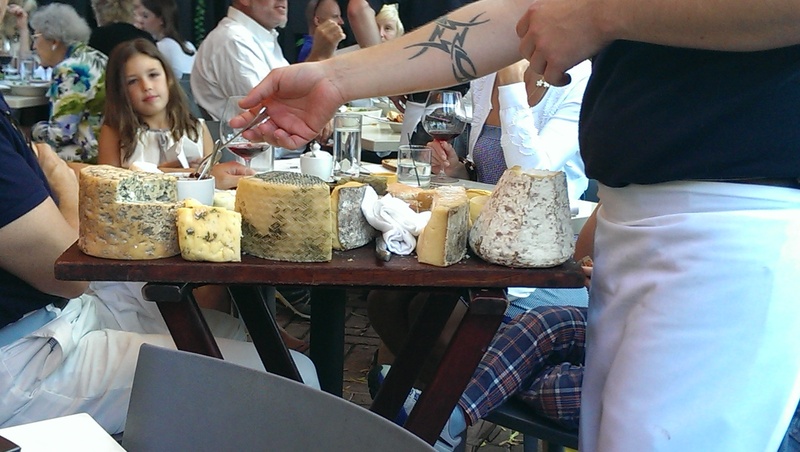 The most popular menu item is hands down the cheese board. It is legendary here in Cleveland and is now being carried on at EDWINS, where the original cheese guy now works, as well. The cheese board offers a huge variety of cheeses – from stinky, soft cheeses oozing deliciousness to cheeses studded with amazing molds to slivers of harder cheeses. There is something for everyone’s taste. The first time I ate here I ordered the cassoulet. It was a cold wintery day, and I was craving comfort. Well, the cassoulet certainly provided it. 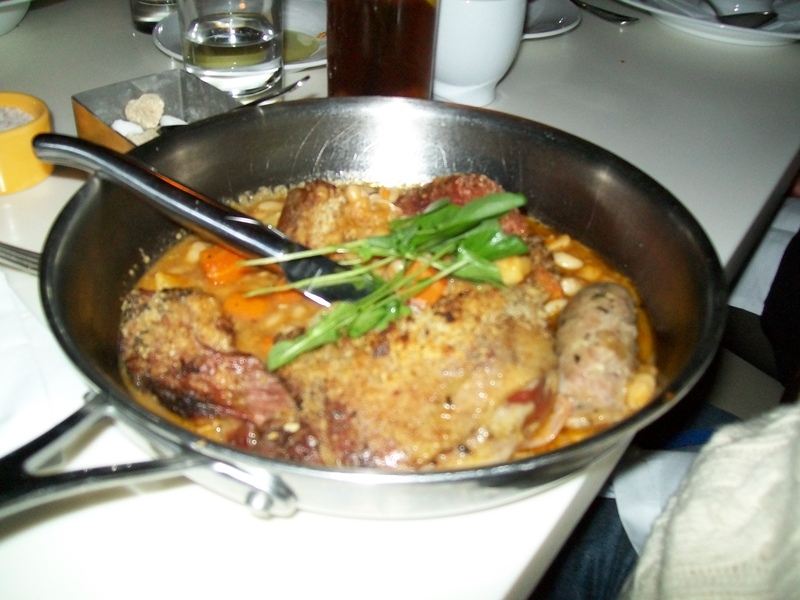 Cassoulet is a traditional French preparation of beans, pork belly, duck, lamb, sausage and vegetables. This is L’Albatros’ most popular dish for good reason. The white beans are perfectly cooked and creamy and served as a bed for the expertly seared pork belly, homemade sausage, duck confit leg with crispy skin and softened root vegetables in a stainless steel skillet. It was filling and made some nice leftovers the next day. Please pardon the blurry picture. I also love their mussels with pomme fries (moule frites) here. 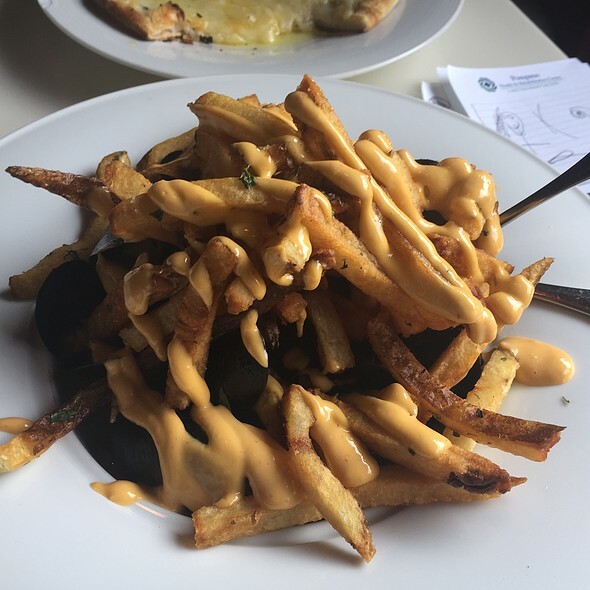 The mussels are cooked in a white wine sauce, and the French fries are crispy and drizzled with a creamy, spicy aioli sauce. This dish is always a delight – no matter how many times I have ordered it. Pure comfort – every time! One of my all-time favorite meals here was enjoyed on their patio. Eating out on the patio in the summer is a different experience from sitting in the intimate indoor seating, but it is equally lovely. 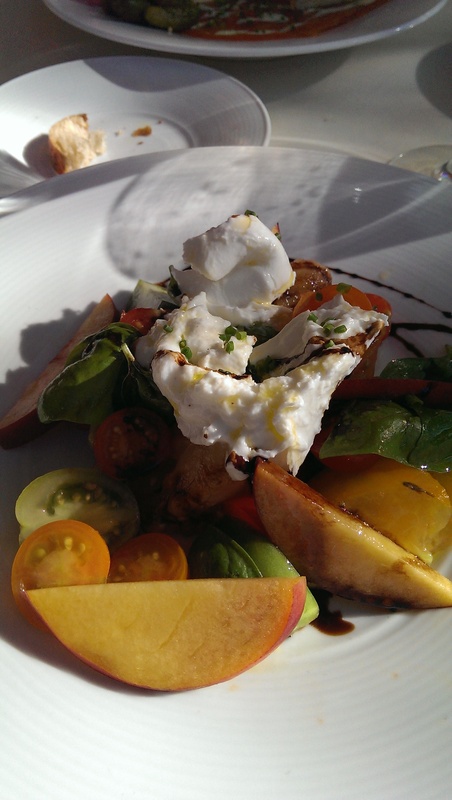 I started off with their peach salad, which featured perfectly ripe peaches, fresh mozzarella, fresh basil, and heirloom tomatoes, drizzled with Zach’s amazing olive oil (I love it so much I buy it at Heinen’s!). It was heavenly. My tablemate ordered the smoked salmon as an appetizer and it too was lovely, served with some cornichons, pickled onion and lemon slices. My entree that day was a special. 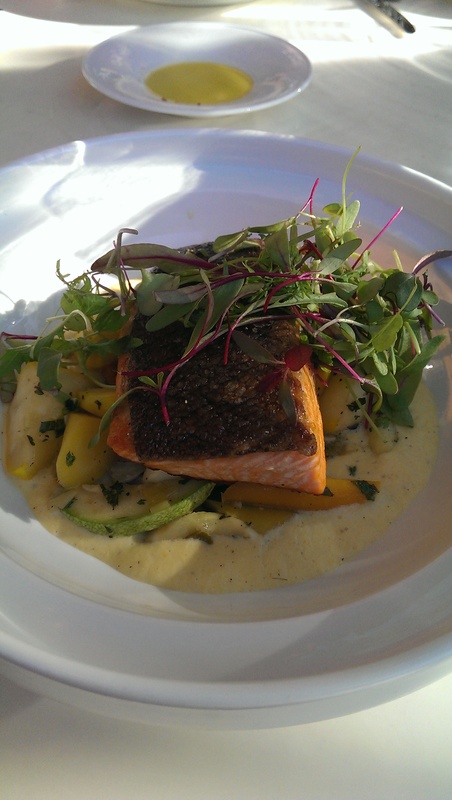 It was a seared trout served over a bed of fresh squash and zucchini and creamed corn and topped with microgreens. It was absolutely divine. The fish was perfectly seared and the creamed corn did not disappoint – although I would have preferred a few more corn chunks. It was more puree than the creamed corn I was hoping for. What meal is complete without dessert? Well, L’Albatros certainly offers some good ones. 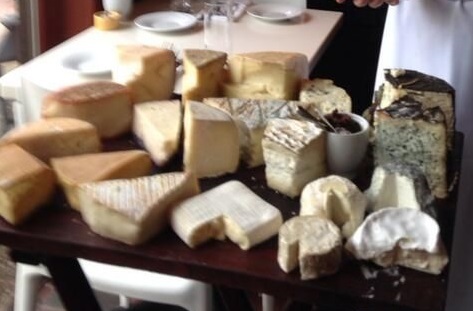 You could be like the French and order the cheese board for dessert. That’s always a good choice. If you prefer something sweeter, I recommend the Chocolate Napoleon or the Crème Caramel. My photo of my Napoleon is worse than the cassoulet, so I won’t torture you with it. Trust me when I say it was divine – crispy thin wafers layered with chocolate mousse and raspberries on a pool of raspberry coulis. We love L’albatros. The French toast appetizer is a “must have” that shouldn’t be missed.